I love where I live. It’s not always been the case, in fact it’s taken most of the last six years for this city-loving, anti-socialite to appreciate the charm of making conversation before 8am on public transport. The image I had of my future didn’t contain a small rural town, but there is magic in the smell of the sea and becoming a kent face. I’ve always equated adventure cycling with exotic places, yet my abject failure to manage a monthly microadventure last year was surprisingly overshadowed by the regular pleasure of cycling the 30 miles home from Edinburgh and exploring the roads and tracks on my doorstep at the weekend. My unexpected brushes with bats, owls and weasels gave me the same delight as glimpses of elephants in India, and without the threat of rabid dogs. 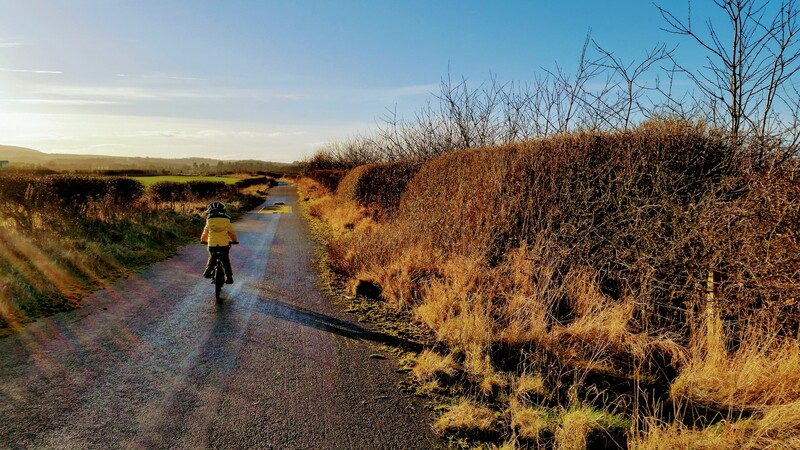 East Lothian is blessed with ‘accessible epic’ and you don’t need to pedal too many miles to find yourself lost and alone if that’s what you’re looking for. With a breathtaking coastline and a network of quiet backroads and off roads paths, there are adventures that can be had without leaving home. That said, the commute to and from Edinburgh isn’t all fun fun fun, in fact much of the ‘infrastructure’ is on the spectrum between shockingly poor and none existent. We have some distance to travel before cycling becomes a safe and appealing transport options for everyday journeys. But once free of the sprawl outside Edinburgh, the sky opens up over East Lothian, the roads become less congested and you can pedal for miles in salty air or by farmers fields. You can skip the worst part by taking the train to Longniddry, which deposits you by NCN76 off route path that takes you to Haddington, and starting from there (other towns and train stations are available). On the NCN76 you’ll find the Loft in Haddington – its about 12 miles on shared use ‘path’ and quiet roads from Dunbar. You can also check out Hailes Castle on the way if you need some historic ruins. One of the first places I cycled with my son in a toddler seat was Smeaton Garden Centre and tearoom – at less than 7 miles from Dunbar, heading towards North Berwick, it provided a perfectly timed stop on quiet roads. You’ll also get to see a great ford, which is high on some people’s sightseeing lists. Now my son can pedal himself we often cycle to the Store at Belhaven Fruit Farm for lunch to maximise the off road miles. If you’d like a small off road adventure, particularly suited to small people, you can follow the walking route of the John Muir Way from Dunbar, taking in the Foxlake Boardside cafe just outside town – I tend to go for the Oreo milkshake, which is like cold, liquid cake. If you like some hills with your cake, then the cycle-loving Lantern Rouge in Gifford is perfect and just 14 miles from Dunbar. 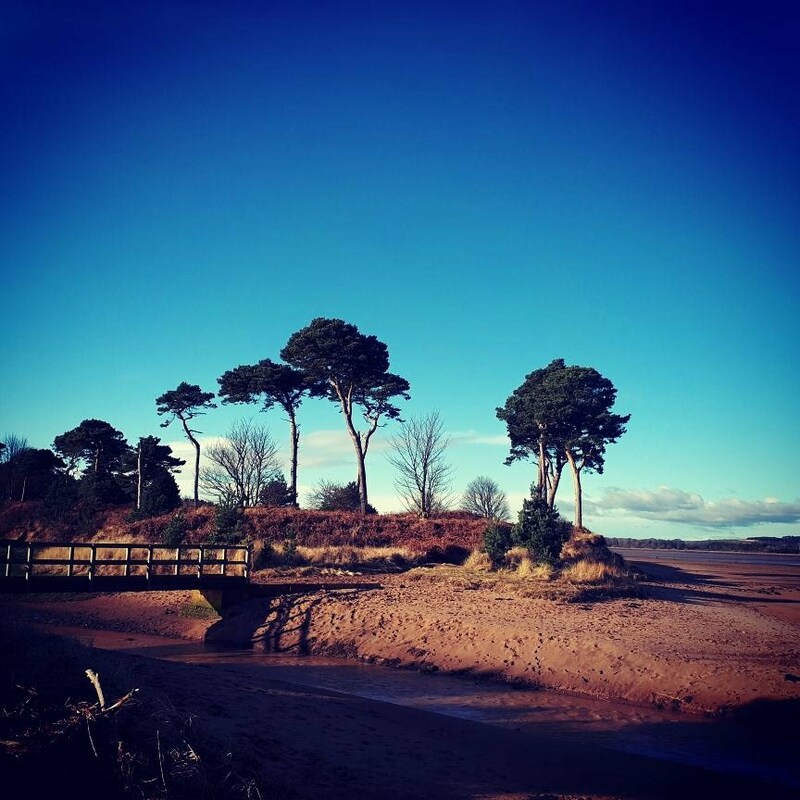 There are a number of different, quiet routes you can take through East Lothian villages. If you’re feeling particularly hungry, you can pop in for cake and then head to Haddington a couple of miles down the road for posh cake at Falko. By following the cycling route of the John Muir Way for the first 12 miles from Dunbar to North Berwick you can sample the fabulous cake selection at Steampunk just of the main shopping street. They have a bicycle on the wall so you know you are in the right place. 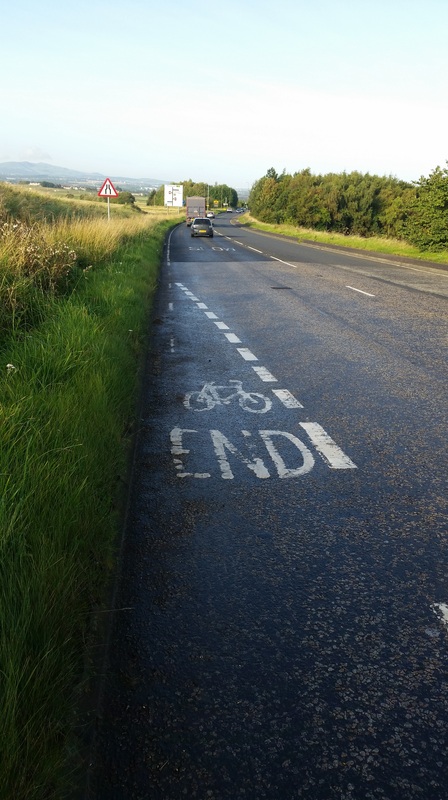 Further afield you can follow the NCN76 east, passing over the glorious Coldingham Moor. I’ve not discovered great cake yet in Coldingham, although the beach is lovely, so usually stay on the NCN until Eyemouth to cake eat at the Rialto, a lovely family owned cafe close to the beach. With Storm Ophelia still giving us a hard time I’ve battened down my hatches and got the summer photos out to remind myself of what the world looked like before it went grey and wet. Ooh! The new station at Tweedbank! Ah yes, I live in Scotland so the summer isn’t all ice cream and sea bathing, unless you are one of those really hard people that wear shorts because ‘it’s summer’ rather than after a sensible assessment of the weather conditions. I am not one of those people and so carry a good supply of high quality merino wool clothing with me at all times of year, particularly when cycling. The carriage of said merino wool items occupied much of my ‘free time’ (time that I should be using to encourage my child to eat vegetables, read, be kind etc) over the summer in preparation for An Adult Microadventure. No, nothing weird, just an adventure where I don’t have to say ‘please sit on your bottom’ every minute at every meal time. Gloriously released from all my domestic duties by my husband taking our son to Denmark for a few days, my friend Claire and I planned a weekend cycling adventure to try and keep my monthly tally on track. Claire looked at many maps and I procured a new Alpkit bag for the merino items. We were ready to pedal. But where? We’ve both travelled, are quite adventurous, not too short of cash and love good food. So naturally we booked ourselves into the Kirk Yetholm youth hostel and jumped on a ScotRail train to the Scottish Borders. (NB For those of us that have lived through the will they/won’t they ever re-open the railway line between Edinburgh and the Borders saga the previous sentence is much more exciting than it initially appears). Seen one Abbey? You’ve seen them all (probably).. Starting out in Melrose, we soon realised that we were simply too tight-fisted to pay the entrance fee and our money was much more likely to be spent in bookshops and cake shops. I’m sure someone is itching to point out that a Historic Scotland Explorer Pass is well worth the money, but now I’ve done it you don’t need to. Kelso Abbey is fee free, so we did have one full immersion abbey experience. I’m very glad I’m not a 12th century monk as the monk lifestyle seemed to contain very early mornings and very little cake. My parents sweetly phone or text after every weather event hits the UK, because somehow they think it will be so much worse in Scotland and we may have been swept away in a flood/hurricane/snowstorm. Okay, so the rain is much wetter here but I have mislaid my waterproof trousers due to infrequent use. However, in the interests of Keeping Scotland Beautiful (and free of more people) please don’t share the following two photographs widely. I understand that gin is fashionable, which may or may not be related to my taking it up in later life, but I hadn’t quite realised that everywhere is now producing its own. We found this excellent local example at the superb Plough Hotel in Town Yetholm. Historic Scotland’s loss is the Kelso Gin Company’s gain as I spent all my excess money on gin. Just doing my bit for the rural economy. Does it get any better than Elephant Gin for someone that owns an Elephant Bike? Well that isn’t quite true, as both the hostel and pub in Yetholm were packed and there was an extensive selection of tourists and locals in each of the towns we passed through- several of whom stopped me to admire my bike and its baggage. But there were also miles and miles of quiet roads, smaller towns – big shout out to gorgeous Morebattle and its lovely Teapot Street – and villages. The Four Abbeys route coincides at some points with St Cuthberts Way, a long distance walking route between Holy Island in Northumberland and Melrose in the Scottish Borders so you can expect to see some ramblers too. Claire has taught me many things in the few years that I’ve know her, but one of the most significant is that you can have a great adventure just a few miles from where you live. My eyebrows have raised slightly in the past as some of her holiday plans involved travelling no further than an hour on a train from Edinburgh. In my yearnings for exotic adventures I’ve overlooked the enjoyment to be found on my doorstep. Not any more. The main problem of having a job that you love is that you often can’t tell the difference between work and not work so you end up with many weekends that could be classed as either, depending on who you are justifying the activity to. I reflected on this in March when I ‘worked’ every weekend, spending most Saturday nights at the cutting edge of cycling campaigning with this woman in hotel rooms (see why hotels here) across Scotland in matching #walkcyclevote hoodies. The Work Gods kept up their interference into April, then handed over to the Wet Weather Gods. The tone was set as I decided not to take the bikes on our planned camping cycling adventure in Ballachulish as the Met Office was indicting a canoe would be more suitable. This was one of the very few photos taken outside for fear of my phone being swept away in the raging torrents water pouring over the west coast of Scotland. My husband already tolerates me and (what he perceives as) my quasi-religious love of cycling, so asking him to cycle and camp on his own birthday weekend – my only free weekend in June – seemed abit much. 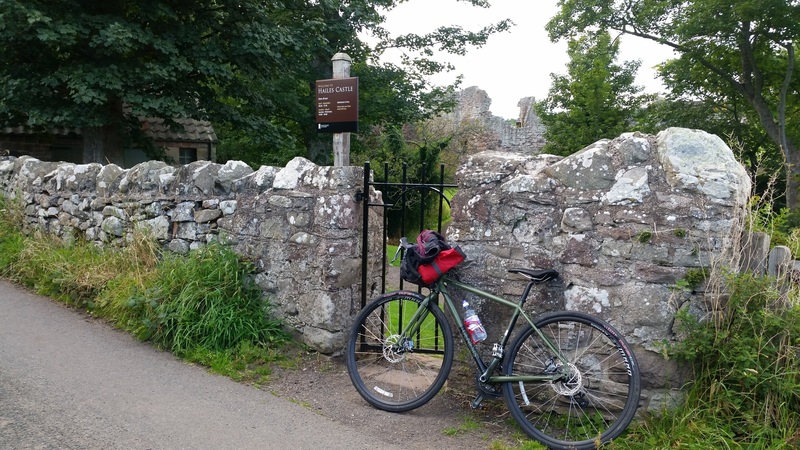 My beloved prefers the finer things in life so to preserve some notion of comfort the duvet was duly packed with our family tent for the less wild alternative to the microadventure – a mini adventure to the Kirk Yetholm campsite in the Scottish Borders. It’s a lovely, quiet site with basic facilities and a great local pub within crawling distance and, based on the two visits we’ve made, the sun is always shining there. I did squeeze an almost microadventure into May, claiming it was ‘work’ to my husband and giving both Sally Hinchcliffe and I something to write about by surrendering my GPS in return for a paper map and compass. Oh, only I didn’t write about it. My lovely new tent, the Vango Banshee 300 if you’re interested, finally got its first outing with my neglected Dawes Galaxy along the backroads of Dumfriesshire. The local roads were gloriously quiet, the D&G CTC crew throw an energetic ceilidh and Scottish summer visited us in all its four day glory, giving me the impression that the gods might have finished giving me a hard time. The washing has been done, the photos downloaded and the bikes have been put away (although admittedly not cleaned..) – we’re home from our first family cycle tour and reflecting on what worked and what we’d do differently next time.. I was very pleased with how our ‘child carrying’ set up worked out over the holiday. Our cheap and cheerful Halfords single trailer held up remarkably well, as did the Pound Shop bungee cord securing our son’s bike to the back of it. This arrangement allowed him to ride where it was possible but ensured that he was safe on the busy city sections. Although our son dropped his daytime nap many months ago, the later than usual nights plus general activity and excitement meant he needed a nap during the day – the trailer provided a cosy bolt hole for that as well as being ‘snack central’. 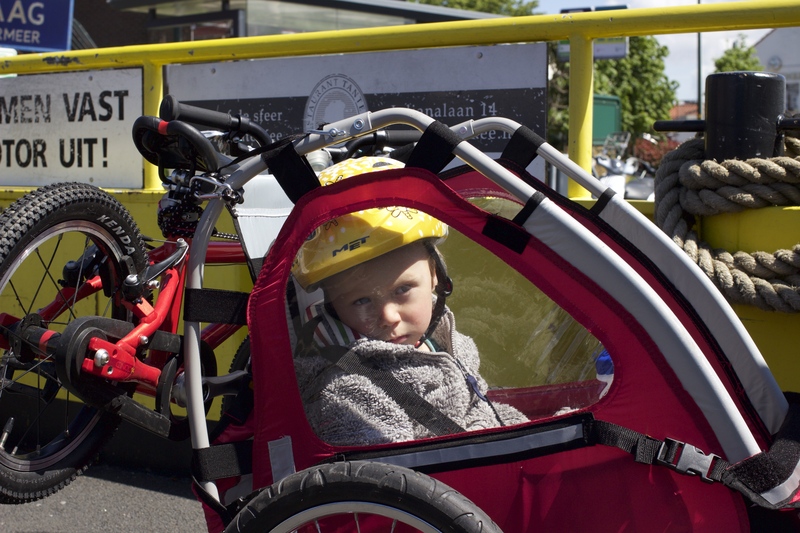 He loved being on his bike so I’m not sure how long he’ll tolerate the trailer, perhaps just another year or so, so we’ll need to think again about mileage and busy city cycling on our next tour. 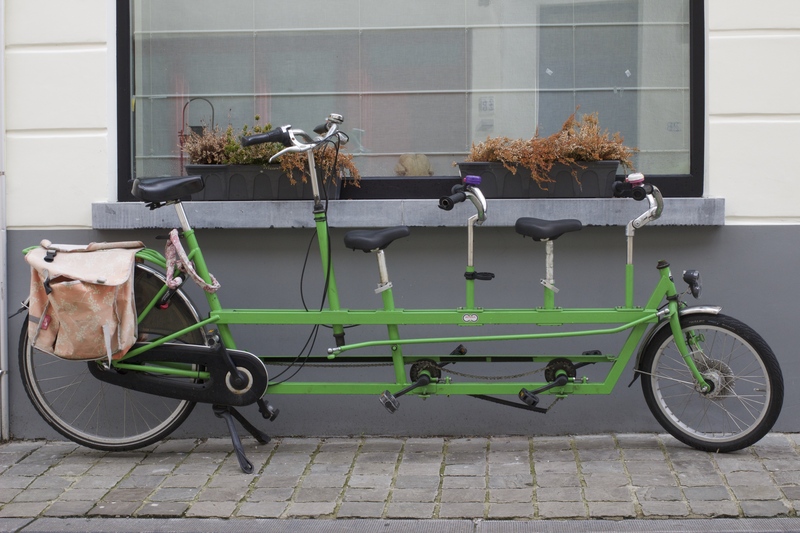 I’m hoping that a Follow Me Tandem might provide an answer. Our total distance was around 150 miles, including the day trips and miles to and from the Newcastle ferry, over eight days. 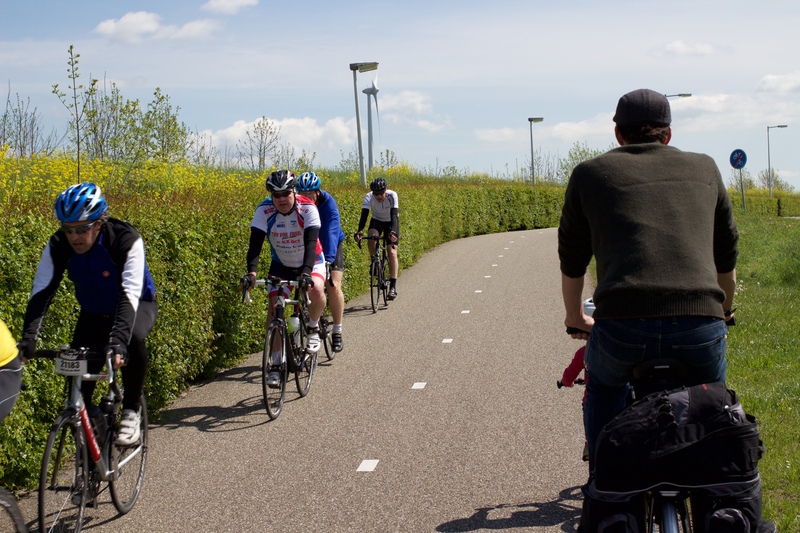 We could have cycled more, but the route we chose (Ijmuiden – Amsterdam – Leiden – The Hague – Rotterdam – train to Bruges and train back to Amsterdam – Ijmuiden) worked well for us. Each day was leisurely and we had time to incorporate breaks, our son cycling and frequent stops to have a ‘discussion’ about where exactly where we thought we were (and how to get somewhere else). 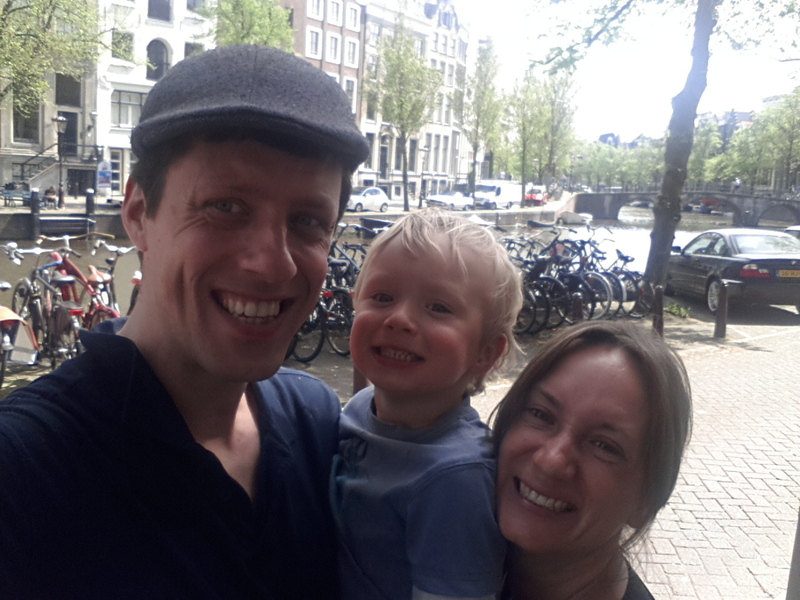 Our son is also mastering toilet useage at the moment so there were many additional stops to discuss this too..
We spent a couple of days each in Amsterdam, Rotterdam and Bruges so we weren’t packing up and cycling every day. This allowed us to get washing done, explore a little more and inspect a few paintings, which was my husband’s top priority. Oh, and take photos of bikes. 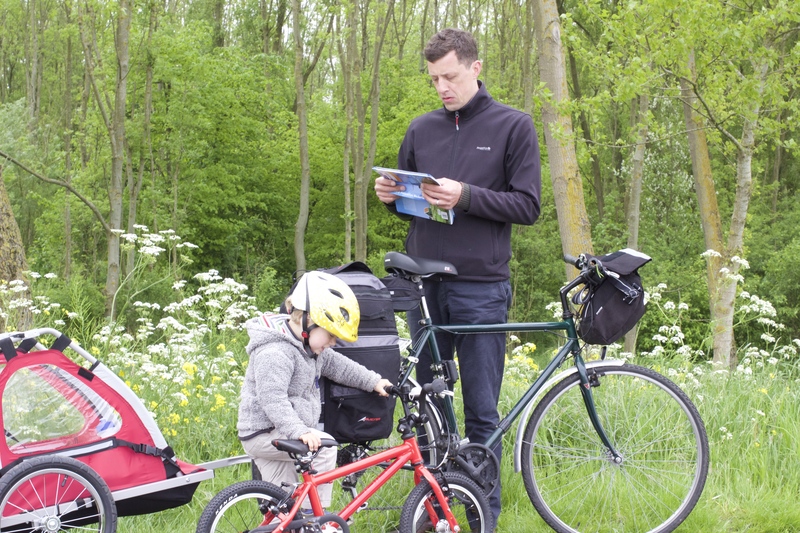 There was no way I would have been able to convince my husband to camp and cycle on the same holiday, so we booked Airbnb apartments in Amsterdam and Bruges, found an apartment in Rotterdam and stayed in hotels for the rest of the journey. Comfortable but expensive, this isn’t a solution for more than a week or two. Warm Showers has been recommended as an affordable but comfortable option so we may try that next time if camping doesn’t meet the required accomodation standards of everyone in our family. I freely admit that I’m regularly lost. I can get lost a few miles from where I live with no difficulty. If route planning and navigation are left up to me I plan to get lost and organise appropriately (snacks, warm clothes, back up power for phone). My husband doesn’t get lost so I bought a map and handed it over. Unfortunately it seems that I should have bought different maps – not just the ANWB A to Z but also the local, detailed maps. Although the junction system is notoriously simple, it does require some time to get used to. We also found that some signs were missing and there were a few issues with the same number being used twice quite close together. I did download the route planning app but without a data connection it only worked until you got lost or confused. Despite all this we got to our destinations with few problems and on lovely paths, although we may have covered more or less miles than we’d originally planned. I think that my next touring purchase will be a GPS that can be pre-loaded with routes and maps. It would also tell us where we’d been, which would be super as we’ve got no account of how may miles we did or where we actually went. 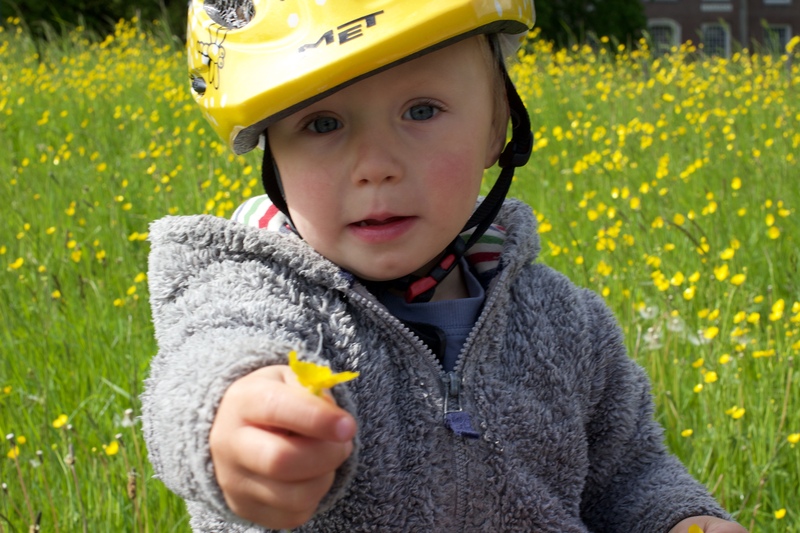 Stop to smell the flowers – Cycle touring is rarely about blasting through onto the next destination but family touring is an altogether slower pace. Our longest day was 30 or 40 miles (we’re not sure – see ‘maps’ below) and we averaged about 5mph. If you’re a parent you’ll know that everything is new and exciting to a three year old; stopping to talk about butterflies and point out the herons was lovely as it helped us see what was important and interesting to our son – he particularly loved stopping to pick flowers for us along the pathside, which made me look at weeds in a new way..
Visit playgrounds – Playgrounds are great for a picnic lunch (we didn’t do this, but saw others and realised we’d missed something) and a run around if your child has been in the trailer for a while. 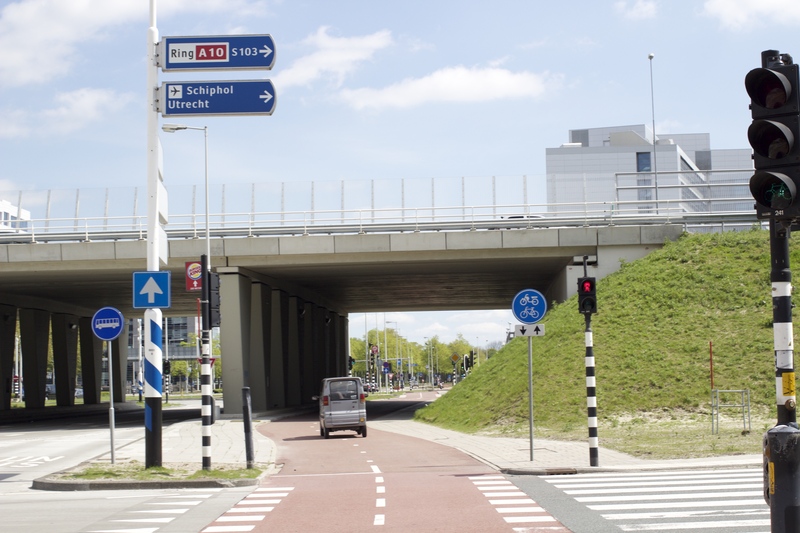 Strong enticement to move on is needed, so be prepared..
Watch out for other road or path users (all of them) – In India I had problems with cows and goats in the road but in the Netherlands the good quality infrastructure attracts people on all sorts of vehicles. 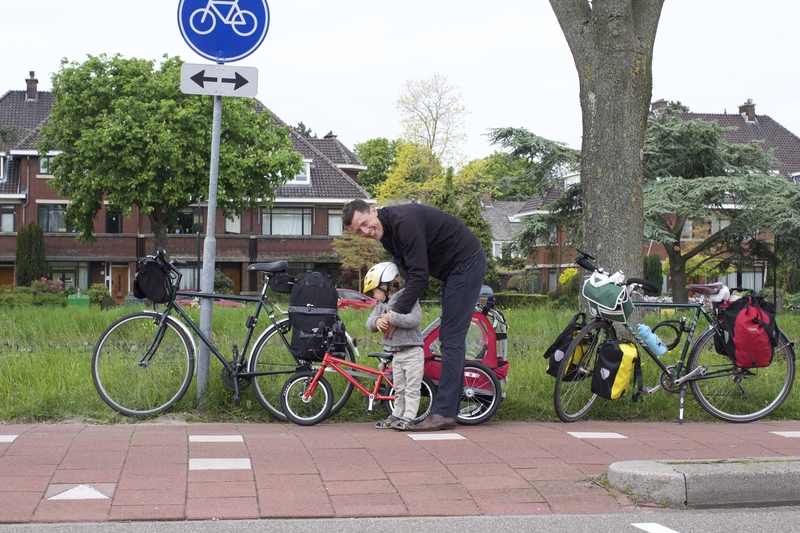 We had some challenges keeping our little one of the ‘right’ side of bi-directional paths. Scooters and tiny little cars (not really sure what they were) are also allowed on Dutch paths, which took us by surprise too. Pack snacks, and then some more – as I’ve said before, you can’t underestimate the fundamental importance of snacks. I put both good and naughty snacks in every bag, having learnt from painful experience. Next time I’ll also be packing some pre-mixed gin and tonics. 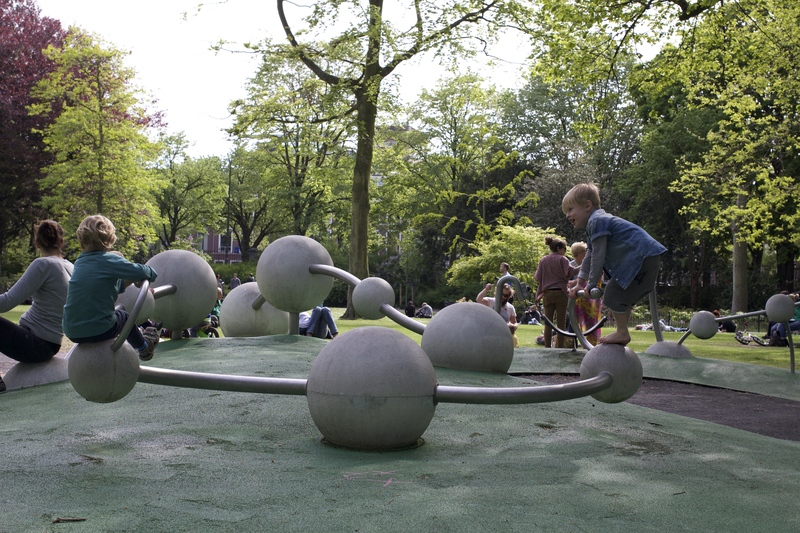 Just Do It – I wish we’d done this when our son was younger! There are some great blogs out there about cycling touring, Travelling Two being the most comprehensive. Their son was born in 2012 so their most recent blogs and films have included an additional passenger – it’s a great source of information and inspiration!